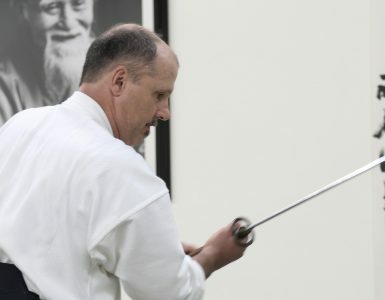 Christian Tissier Shihan (8th dan) talks with Aikido Journal about the health of aikido and what we can do to revitalize the practice and growth of the art. Along with the video of the interview segment, we’ve summarized Tissier Sensei’s key points and our conclusions in this short article. 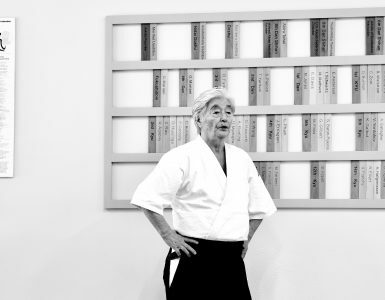 These are insights from one of the greatest living aikido masters. We believe this is a great opportunity for us to listen, reflect, and take action. This is the first installment of a multi-part interview with Tissier Shihan. Additional interview segments will be released in the coming weeks. Christian Tissier has been in the aikido world since 1962. 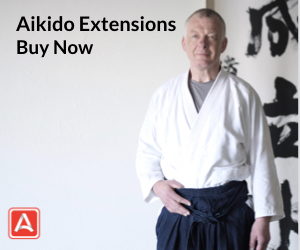 As an internationally renowned master with high level visibility into the global aikido community, he brings a uniquely informed perspective to the conversation about the health of the art. Tissier believes that aikido is not dying, but that growth has plateaued. While not facing imminent doom, the art has entered a period of stagnation when compared to earlier phases of growth. However, he does mention that aikido is growing in areas where it is new, including Russia and China in particular. Tissier believes India may be a huge area for future growth. 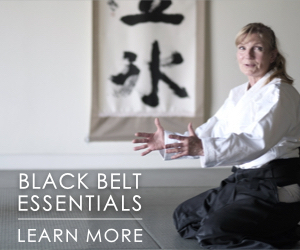 Tissier believes that most traditional budo arts have plateaued. The world is oversaturated with many more options available to people than ever. We’ve also “lost the magic.” Today’s media has a nearly unlimited amount of beautifully produced martial arts. Even the most exotic and spectacular martial feats can be seen by anyone at anytime. Someone walking into a dojo today won’t see anything more amazing than what they can find on their phones. Tissier also believes the role of true budo in today’s world is something that needs to be better defined and communicated. 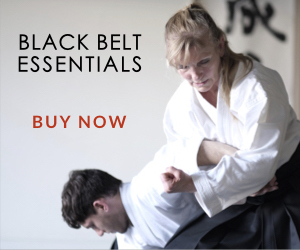 Aikido, along with most traditional martial arts, offer more than just self-defense or fitness. But what is that “something more?” How we define it, deliver it, and communicate it is key to future of aikido. Tissier Sensei outlined four key areas to focus on if we want to improve the health of aikido and attract passionate, dedicated younger students who can lead our art into the future. 1. The Master vs. the Old Teacher: Aikido has been around for many decades now. As a maturing art, many of the most experienced teachers are in their 60s and 70s. Tissier Sensei believes there are two kinds of instructors in this group. Those who are “physically old and technically old,” and those who are true masters. Tissier believes that young people won’t be inspired by those in the first group. My interpretation of my conversation with Tissier is that he believes that if you’re an older teacher and want to attract new students, you must really be “the master,” or you should prioritize using your knowledge to elevate the next generation of teachers and give them more of the spotlight. 2. More Opportunities for Younger Instructors: Tissier believes that in order to attract younger practitioners, they have to be able to relate to their teachers and aspire to be like them. A young student in their 20s can relate to an instructor in their 30s or 40s like a brother or sister and will want to emulate them. This is a critical dynamic that’s an essential component of introducing younger generations to the art and inspiring them to persevere through the challenge of pursuing personal development through budo. Tissier follows this model himself and has it so that most of the classes at his own dojo are led by instructors ages 35-45. He now teaches very few classes at his own dojo. 3. Balancing the Physical and the Spiritual: It’s imperative we think about how we balance the physical and the spiritual as we pursue aikido and represent it to the outside world. Tissier believes that the philosophy of aikido is intrinsically tied to the technique. Seeking the spiritual side in a way that neglects the integrity of the physical practice will breed groups of “strange people” who will be poor ambassadors for our art. 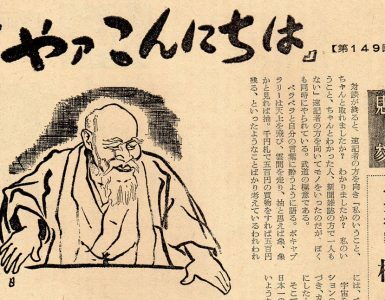 Those that seek the technique only, but don’t think about the moral and philosophical principles of aikido, will fail as leaders. 4. Seeking The Role of True Budo: We need to be honest about the limitations and true nature of our art. Aikido is a “true budo.” Its pursuit requires perseverance, courage, and humility. The payoff is huge, but how do we communicate the value of budo to people in today’s society? We need to think carefully about how we can make budo more relevant and give it meaning in today’s world. Just as importantly, we need to think about how we can communicate and tell that story. I found Tissier Sensei’s clarity and vision persuasive and compelling. We want to do our part, not just to explore his perspective, but to take action. Below are some of the initiatives we’ll be undertaking in the near future. Giving a Spotlight to Younger Teachers: Through Aikido Journal, we’d like to start putting some focus on highlighting some younger instructors with exceptional skill, great potential, and unique and compelling stories. Forging the Masters: One of the fantastic things about aikido is that we can grow and develop in the art over a lifetime. Tissier believes that if a teacher wants to maintain credibility and leadership capability in their later years, they need to be true masters, not just old teachers. The transformation into a true master doesn’t happen by accident and it doesn’t happen overnight. We’d like to explore ways for seasoned teachers in their 30s, 40s, and 50s to elevate themselves to this level. We want to interview and learn from the shihan that have reached this level and successfully raised practitioners to this level. We also want to explore new methods senior instructors can use to fuel their continued development. One initiative already underway is the design and execution of a new breed of an instructor-focused seminar I’ll be hosting with Roy Dean. We’re bringing together a team of seasoned teachers to support and elevate each other through technical exploration. We’ll share the story as it unfolds so we can all see if this kind of training format can be a tool to help us grow into the roles we’ll need to fill in the future. Defining the Role of Budo in Today’s World: Through Aikido Journal, we’d like to continue to seek ways to communicate about aikido in relevant and compelling ways. We plan on getting perspective and guidance from leaders in the aikido world, but also from those with a passion for budo who bring a valuable outside point of view (such as leaders in the media and communications industries or even those new to the art). This is the first segment of a multi-part interview with Christian Tissier Shihan. In future segments, Tissier talks about his memories of Stanley Pranin, shares his thoughts on how aikidoka should think about efforts to evolve the art, gives guidance on how advanced practitioners should approach developing their own personal expressions of aikido, and reveals some personal challenges he’s faced on his own journey. We look forward to releasing this material in the near future. Christian Tissier Shihan, for graciously donating his time and for putting his support behind Aikido Journal. James Friedman Sensei and the 11th Street Dojo, for organizing such a special event and facilitating the interview opportunity with Tissier Shihan. Gustavo Rearte Sensei, for inspiring us through his photography (his images are featured in this post) and being the motivation behind this project. Without Gustavo, the Tissier interview would never have happened and I personally would have missed the opportunity to learn more about the meaning and tradition behind the annual seminar where the interview took place, and its significance for Stanley Pranin. Anne Lee, for her steadfast support of Aikido Journal and this project. With Gustavo on the mat all weekend, Anne was also able to capture many beautiful photos from the event. 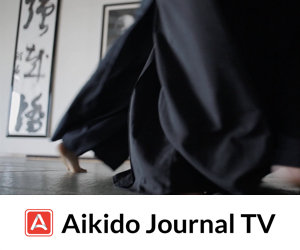 Ikazuchi Dojo, for hosting new content while Aikido Journal’s technical infrastructure is still in flux, and for supporting Aikido Journal projects. Haruo Matsuoka Sensei, for his continued support and guidance. Tissier Shihan is a shining star of Aiki legitimacy, and of Ueshiba Aikido excellence. As his example continues to inspire and encourage new advocates and potential devotees to the serious study of the Art of Morihei Ueshiba, more modern applications of Aiki Principles, and the benefits of Aikido training, will be understood and incorporated byfuture leaders and teachers of this truly unique art form. Thank you for your inspiring and insightful input. Glad to have you here as part of the online community! Outstanding interview, presentation, and format. Thank you upholding Aikido Journal’s high standards with such impeccable integrity. Stan would be very proud of you, as am I. Keep up the great work, I’m looking forward to future installments. This was such an excellent interview! Thank you so much for taking up the torch of Aikido Journal. It’s been such an important part of my development in the art, and seems it will continue to inspire. Absolutely right. We need younger teachers to inspire the younger generation. How many times have students who start and then leave tell you they didn’t like the classes because there were too many old people there? The hard thing though will be to convince the older teachers to step aside for the younger ones. Tissier Sensei is a perfect example of how this is being done. You’re doing a great job Josh. Stanley certainly would be proud of all you have done so far. i met Tissier sensei once at a seminar and he told me that he sends his senior students learn Thai boxing on the side. And that he was a professional Thai boxer himself. No wonder his aikido is marvelous. I completely agree with your comment Manolis, and it’s up to us to seek out and cross train in the disciplines that can enhance our Aikido practice. TISSIER Shihan m’a inspiré de commencer l’apprentissage de l’Aïkido et j’espère un jour je serai Hachidan comme lui. Teaching kids classes with a curriculum designed for them is a great way to grow any activity as it creates students who are dedicated to the art over their entire life. After teaching aikido for 30 years I hung up my hakama as it was becoming too difficult to attract and keep students. I appreciate a previous article in which you talked about vetting potential students before accepting them into class. This may have been my personal downfall as a teacher. In my quest for students I ended up accepting some who did not have the love of aikido and respect for others needed to grow the dojo. I will soon turn 65 years old and feel put aside by the comments in this recent article. I do not believe aikido’s troubles are related to the age of instructors but to an aging aikido which refuses to accept change. What is the specificity of aikido if not the development of Ki. That is why the art is called Ai KI Do. The physical practice is essential to help understand through ones own life experience the existence and function of Ki. Without this Aikido often becomes an expression of one’s own ego. And finally it has to be fun, with lots of smiles and laughter. I have see too many Masters too concerned with performance than fun and lively interaction with other students. Great to hear from you! I agree with your comments about designing tailored curriculum for kids in order to keep them engaged. Teaching kids properly is very difficult and requires a different mindset and teaching strategy than instructing adults. One of the reasons we stopped teaching kids classes at Ikazuchi Dojo is that we realized how much work needs to go in to developing an exceptional children’s program. With limited resources, we decided to focus on making our programs for adults excellent and allow other dojos to specialize in kids instruction. 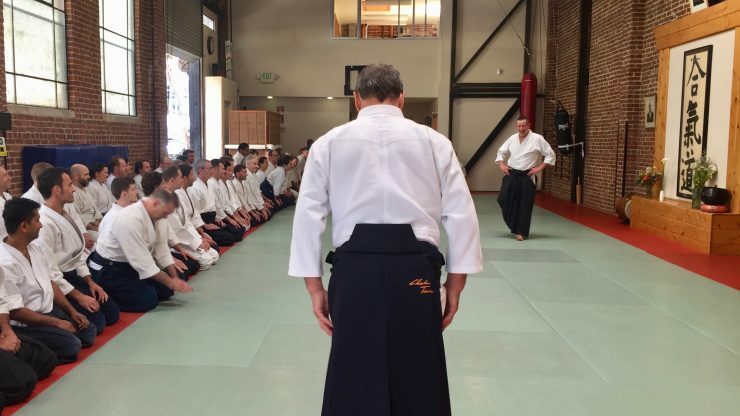 I think Tissier Sensei’s comments about the age of instructors are not meant to indicate that all of aikido’s problems are related to this, or that there’s no place for older instructors. I think he’s just saying that teen and young adult students will connect better with younger instructors, and that as older instructors, we should really focus both on elevating ourselves and forging quality young instructors. Tissier himself is in his 60s and follows this approach. I also personally agree with you that many of aikido’s problems are related to the refusal to accept change. I think many recognize that change needs to happen, but they want to make sure that the change is positive and not everyone agrees on what that looks like. Hopefully we can all inspire each other to evolve both ourselves and the art of aikido in a positive and quality way. I also don’t think sharp technical performance and having fun in training are mutually exclusive things. At last in my personal experience, I find that if I’m taking ukemi or throwing at a high-level of intensity or performance, I’m usually not smiling in mid-throw as I need 100% focus to be in the moment and make sure I’m protecting myself and my partner. However, we all have great fun and there are plenty of smiles on and off the mat. At least at our dojo we create plenty of positive, lively interaction through the process of seeking technical excellence together. Great commentary by Tissier Shihan. Thank you Josh. It was great to see this interview! Thank you very much. I train in Japan and here most dojos are very resistant to change! Rather than focus on children’s classes, the main group for future generations is the university Aikido clubs! (That is how many of the Hombu Shihans joined Aikikai.) However, here in Hokkaido, most of the teachers are in their late 60s and 70s and we are in a desperate situation to groom the new generation of teachers. I wish the teachers would fully support the younger members and let them assume leadership roles! Bu güzel ve yenilikçi düşünceler için teşekürler. Dünya’yı hep gençler ve yeni düşünceler ileri götürmüştür. Aikido ve diğer alanlarda da öğretmenler çocuklar ve gençler için rol model olacak yaşta olmalı.En fazla 3 – 5 yaş yukarıda olmalı. Aynı zamanda yaşayanlar olmalı. A question comes up to the sentence in 1.The Master vs the old teacher: …….Tissier Sensei believes there are two kinds of instructors in this group. Those who are “physically old and technically old,” and those who are true masters……. What is a true Master in aikido, if Aikido includes technical skill and spiritual insight. How would he define a “true master”, how would he or she look like and act? I believe the key for survival and permanence of anything is adaptability, this principle applies to everything around us like other species, disciplines, arts, traditions, and ourselves. If we want to thrive in any area of life we must adapt to the conditions of the environment be it at work, at home, or pursuing the art we love. Adapting does not mean changing, we have to preserve the tradition and principles that define the art but evolve and adapt to the environment of growing martial disciplines that offer the physical and technical training that attract new and young students and this in turn will revitalize the practice and perspective of the current practitioners. Masakatsu agatsu (victory over the self)is one of Aikido’s principal tenets, and it should apply to the art itself as well as to the students. If we want to be better that our yesterday self, we need to adapt and evolve absorbing new and useful things and getting rid of that which stops our progress and development. Aikido can benefit from this same ideology. Another concept that we can apply to Aikido is Tenkan. The same way we blend with uke and turn shifting our own perspective and focus to the one that uke has to then guide him, we can mentally blend and turn to look at the perspective of other arts, this way we can learn things that we might not have found if we just kept going forward with a narrow vision. Great, well written comment. Thank you for contributing! I started aikido 30 years ago (age 13), and I have been 1st dan for the last 20. Why? A French proverb says: “Student surpasses the Master”. It might define a Master as the one who allows his students to surpass him”. The others are instructors. It is most unfortunate that our Aikido community is plagued with black belts wanting to only achieve and maintain authority and ignore their own mistakes. Furthermore, Tissier Shihan was right about the low percentage of really knowledgable and talented Aikido masters. I stopped checking or respecting the number of dans. It is merely an indicator but not proof of talent. Aikido first and foremost needs to get its internal politics right. We need to listen to our followers’ needs. We need re-evaluate whether or not Aikido is a self-defence or a dance discipline. If the former, we must be held responsible that what we teach will not get someone killed on the street. Black belt is not an achievement, it is responsibility.